From acclaimed photographer and famed lover of dogs Elliott Erwitt comes Woof, the most unintentionally persuasive advertisement for dog ownership there ever was. Erwitt's eye is unfailing, and his love for dogs is captured in each and every photo. Digging a hole, barking at a cat, jauntily carrying a stick—Erwitt takes these ordinary moments and makes them extraordinary. The humorist P. G. Wodehouse once said of Erwitt, 'There’s not a sitter in his gallery that doesn't melt the heart, and no beastly class distinctions, either. Thoroughbreds and mutts, they are all there.' Add to that the level of respect Mr. Erwitt shows for his subjects: whether it be a scruffy little terrier pausing for a quick pant or a herding dog intensely focused on her flock, with one click of the shutter the individuality of each and every dog is conveyed and memorialized. 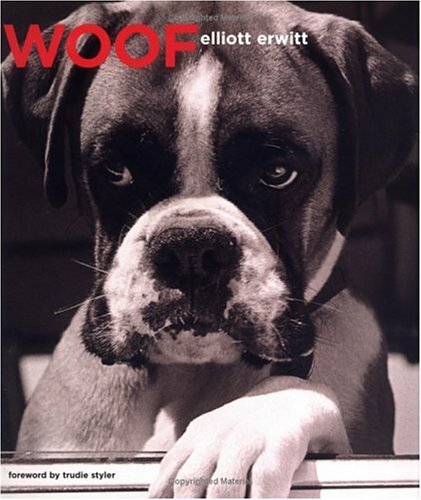 Mostly new photographs, with a couple of old favorites sprinkled in for good measure, Woof is a celebration of dogs at their finest.